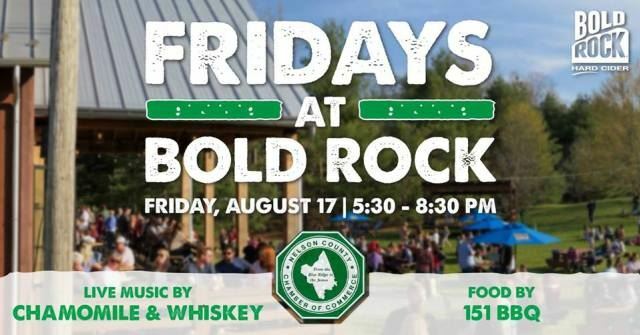 Join the Nelson County Chamber of Commerce in celebrating the start of the weekend with Fridays at Bold Rock Cidery, a FREE once per month music and food festival at the Bold Rock Barrel Barn! Fridays at Bold Rock on June 15th features live tunes by Chamomile & Whiskey starting at 5:30 PM with food provided by 151 BBQ and MWO Food Truck! Raffles & Door prizes will round out the fun and $1 from each pint will contribute to the Nelson County Chamber of Commerce operating fund to allow for charitable donations and other facilitation of the growing Nelson County, Virginia business community!